Robert Trever was the grandfather of Mabel Ora Risheill. She was my husband's great grandmother. Religion seems to be a running theme through my family's genealogy and the Trever family is no exception. Robert was born in South Killingholme, England in the year 1843. The family name is spelled variously Trever, Trevor and Trey. 1838 Dickens publishes "Oliver Twist"
South Killingholme is a rural village on the Humber River in the county of Lincolnshire. Robert's father, Joseph, 1800-1869, was the son of Richard Trever, 1774-1844 and Elizabeth Farrow, 1775- before 1804. His mother died when he was young and his father remarried in 1804 and had quite a few other children with his second wife, Mary Baxter. Joseph Trever was a farmer by trade. He was born and lived in Ingham, Lincolnshire his whole life. Joseph married Elizabeth Medley 1801-1872, in Market Rasen, Lincolnshire in 1822. Joseph and Elizabeth had at least nine children. Richard had four brothers and four sisters. Remarkably, he and at least two of his brothers became Methodist Ministers. In his obituary, it stated that he was converted to the Wesleyan Methodist faith at age 14 and began preaching at age 19. In the 1861 census Robert was an apprentice tailor, he lived in the nearby village of Halton, Lincolnshire. He married Jemina Whydale on 11 April 1864 in Wainfleet All Saints. Jemina was the daughter of Edward Whydale and Frances Allinson. She was born in 1834 in Bourgh Le Marsh, Lincolnshire. Her mother died in October 1840 after the birth of her second child, Ebenezer Whydale. In the 1841 census Jemima was living in Bourgh Le Marsh with an unidentified family. Her brother lived with another family in Burgh, and her father was living in Market Rasen. Edward, her father was a lodger and later married Eliza Dent, who was the family servant in the home in which he lived. Ten years later, in the 1851 census, Jemina was working as a servant in Skidbrooke With Saltfleet, what great names they have in England! 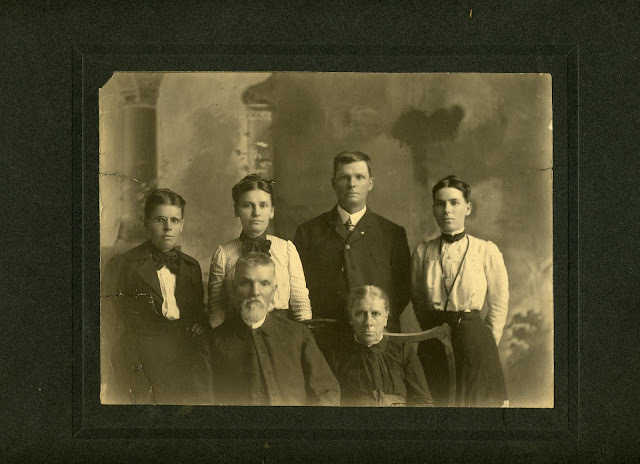 Jemina's father was a bootmaker by trade, but in the 1881 census he was listed as a local preacher. The Methodist Church in England was started, if you will, by John Wesley, his brother and others from his College. John Wesley was from North Lincolnshire. The Methodism movement was spread by revival and one of its founders was a proponent of itinerant open air preaching. It is possible that that was what Jemima's father was, as it seems unlikely that he underwent any sort of theological training. Robert Trever's oldest brother, William Medley Trever, was a teacher in 1861, Joseph Sanderson Trever was a joiner, his brother Henry was a tailor and Charles was an agricultural laborer. His sister Catherine had immigrated to the US sometime prior to the 1860 census. At that time she was living with her husband Samuel John Sparks, his children and their children in Outagamie, Wisconsin. I am guessing that she immigrated with a first husband and then married Samuel John in the US, but that's just a guess. Catherine is followed to the US by her brothers, William in 1869, Joseph and Robert in 1870 and Henry in 1874. Their other siblings stayed in England. On 9 June 1870, Robert and Jemima Trever and his brother Joseph and his family landed in New York. They would eventually end up in Wisconsin. Their older brother William had arrived in October of 1869, presumably they were to join him and their sister in Wisconsin. William and Joseph lived out their days in Wisconsin, Robert however moved on to Nebraska and then Kansas. In the 1880 census, Robert and Jemima lived in Washington, Harlan, Nebraska. He listed his occupation as a tailor. His brother Henry lived nearby, he was also a tailor. In 1900 the census showed him living with Jemima in Dicks, Woods, Oklahoma. In 1915 and 1920 he was in Kansas City, Kansas. According to his obituary, in the fall of 1902 he and Jemima moved to Greenville, Illinois. Jemima died there in 1907, she was buried in the Montrose Cemetery. Robert moved back to Kansas City to live with his daughter Kate Trever Coe and her husband. They ran a home for "wayward women and orphans" called Life Line Ministries. Robert Trever was a Methodist Circuit Preacher, traveling from settlement to settlement. I imagine it was a difficult life for him and his family. Robert died at the home of his daughter Kate on January 19, 1922. He is buried in Greenville, Illinois, a long way from South Killingholme, England. Robert and Jemima had six children, their oldest Elizabeth Mirriam Trever was the mother of Mabel. They also had Mary Louise, Joseph Edward, Kate, William Albert (died young) and Annie. Back: Kate Coe and ? Mary Louise Joseph Edward and ?